A few beers worth noting this week. 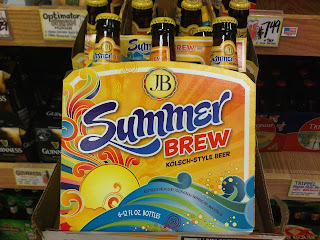 First up is Trader Joe's latest, Summer Brew, a Kolsch style beer. Kolsch beers are rare in this part of the country; in fact, I can only think of one other available, and that is one that Shiner makes annually. The style originated in, and is a specialty of, Cologne, Germany. It is what I'd refer to as a "delicate little ale", as it is very light in color, body, and flavor. Fellow beer geek Andreas (who lived many years in Germany) tells me that the style is served in tall, thin (delicate)glasses in Cologne. The TJs version is 4.8% abv, which makes for a sessionable Summer drink. I thought it was ok, but my buddy Solis thinks it tastes like Bud Light. Too bad, I like Miller Lite better. Good price for the Summer Brew at $5.99 a six-pack. Less Summery, but packing a big punch, is Left Hand's Imperial Stout. 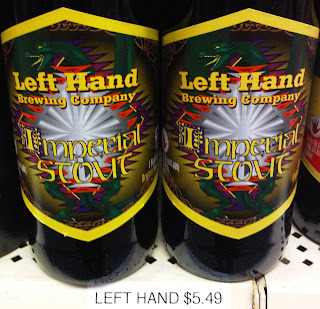 I wrote last week about the return of Left Hand's Milk Stout, which had disappeared from the area for awhile. I don't know if the Imperial Stout was ever in Albuquerque stores. Though it may not be the most timely introduction, a 10% stout is always welcome no matter what the season. Kelly's has this beer on the shelves at $5.49 for a bomber bottle, but who knows? I have brought beers up to the counter that were listed at on price but rang up for more on the register. But if you can get it for that price, it is a steal. Another beer style that you don't get here often is Scotch Ale. You can get Mc Ewan's here, and Sam Adams makes one that you get in a mixed pack, though full six-packs of just Scotch Ale pop up now and then. Kelly's Brewpub on Central Ave also makes a beer of this style. Full Sail has brought Keelhauler into the mix as part of their Brewmaster's Reserve series. I've found this style to be a "love it or hate it" type, mostly to the band-aid like flavor that dominates many of the versions. 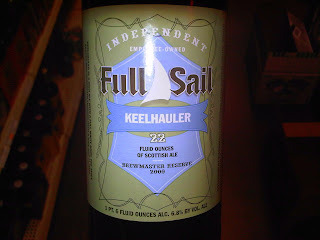 Keelhauler is 6.8% abv, and priced right at $4.49. That's one thing I really like about Full Sail- they could label something as "Brewmaster's Reserve" and hike the price to 8 or 10 bucks, but they keep things reasonable at $4.49. Then again, not many people would pay 8 bucks for a band-aid. I think you're right; Miller is better. I think since college, my pallet has been tainted by kegs of Bud.